Perched on the hillside in the Smoky Mountains is Jennie’s Cove, a 6-bedroom, 6-bath pet-friendly cabin with room for 18 guests. 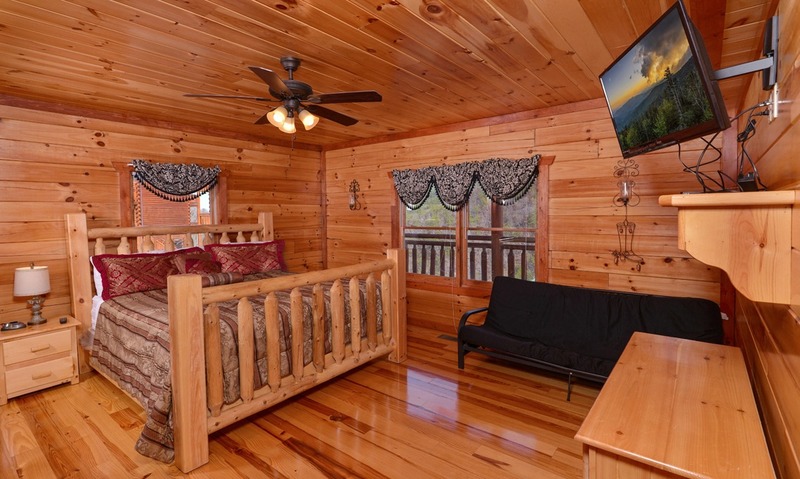 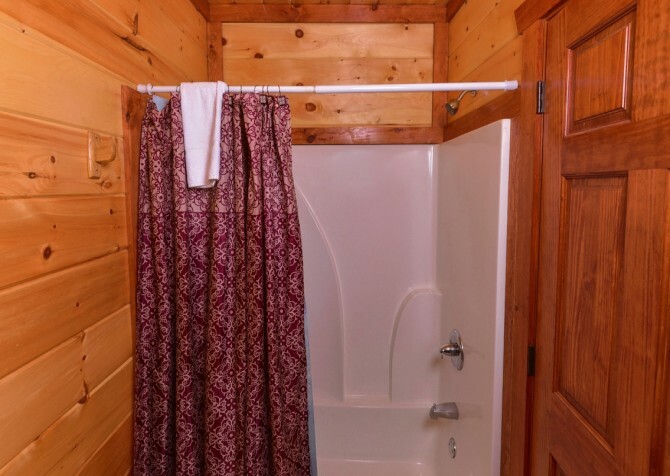 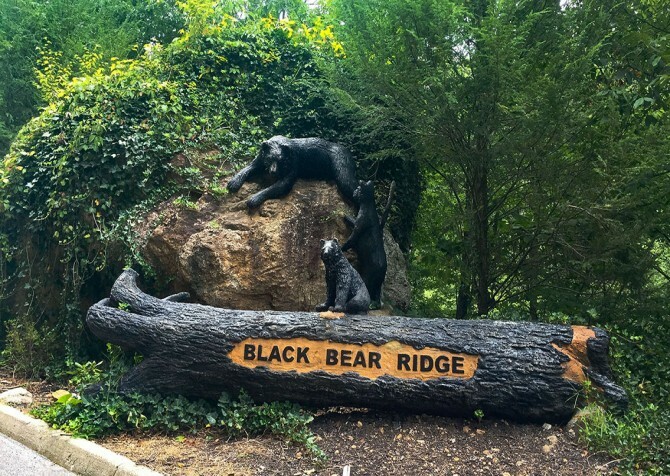 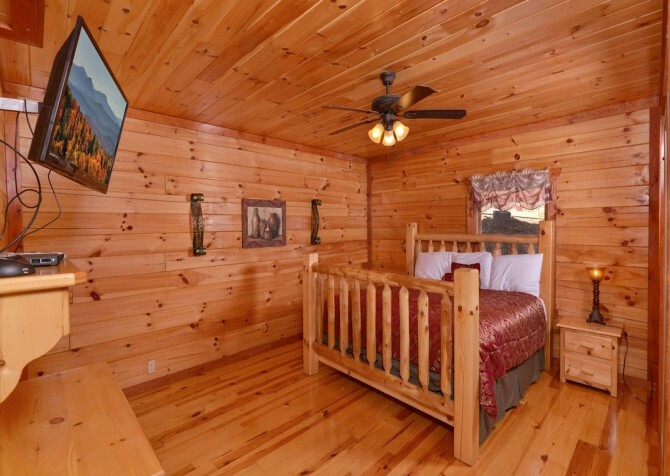 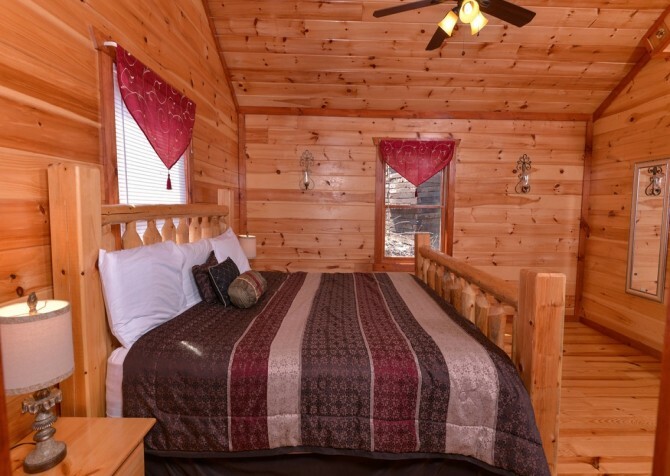 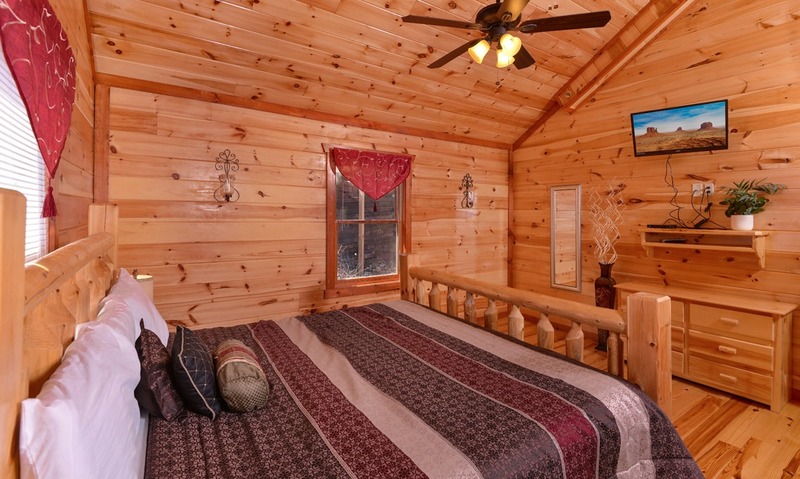 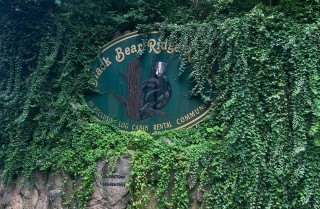 This modern Pigeon Forge cabin is conveniently located inside the Black Bear Ridge Resort, which means you’ll be less than 5 miles from downtown when you’re ready for an evening out. But even if you stay at the cabin, Jennie’s Cove provides tons of entertaining options, including a game room with an arcade and pool table; a cushy theater room with a big screen TV; and a private indoor pool! 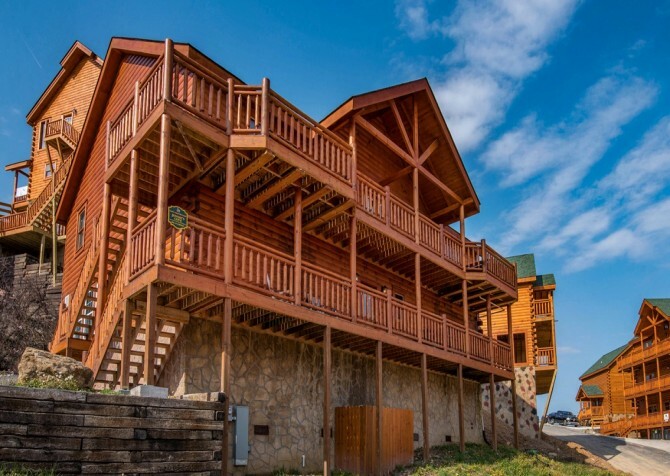 Whether you’re traveling with adults or teenagers, Jennie’s Cove has something to keep everyone in your group entertained. This large cabin also provides an open and airy atmosphere with natural wooden walls and ceilings, log-style furniture, and classic Smoky Mountain décor. When you’re ready to take it to the deck, enjoy large open-air and covered porches with mountain views, rocking chairs, and an outdoor hot tub. 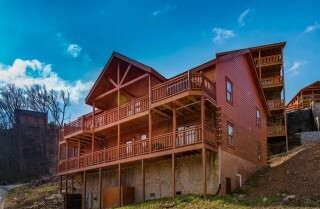 Bring your family, a group of friends, your wedding party, or any other mix of 18 guests, and enjoy some much-deserved time away in the Smokies at Jennie’s Cove! 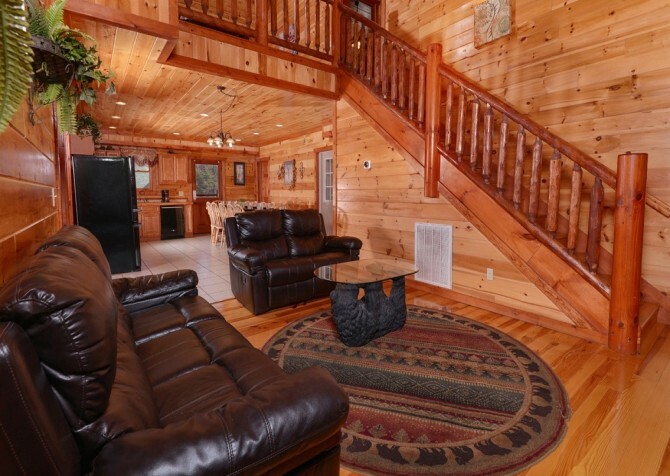 The high ceilings and large windows of the Jennie’s Cove living room help to create an open and airy feel throughout your stay. 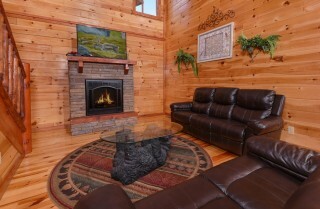 Sit back on one of two comfortable leather couches, place your drink and a tray of snacks on the coffee table, and settle in for a night of sitcoms on the big screen TV mounted above the fireplace. 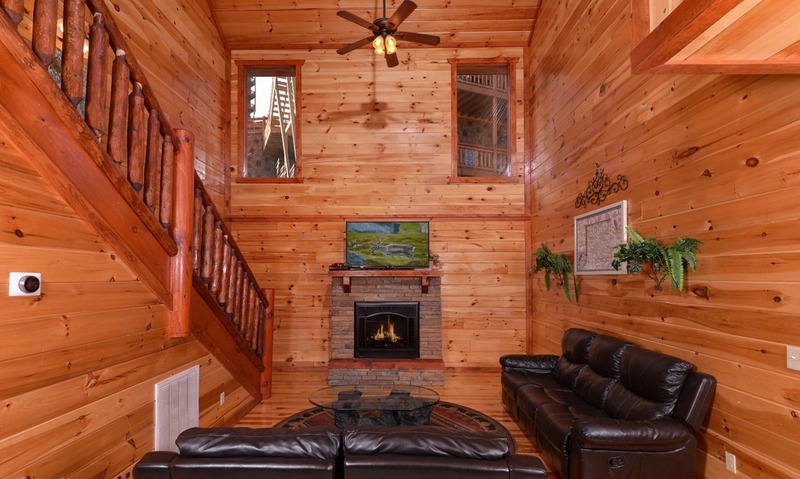 The stone fireplace inside this cabin’s living room is electric (heat), which means you’ll have any easy time switching it on during a blustery Smoky Mountain evening. If you’re looking for a space to relax, take a nap, catch up on a favorite show, or swap memories from your downtown adventures, don’t miss the Jennie’s Cove living room. 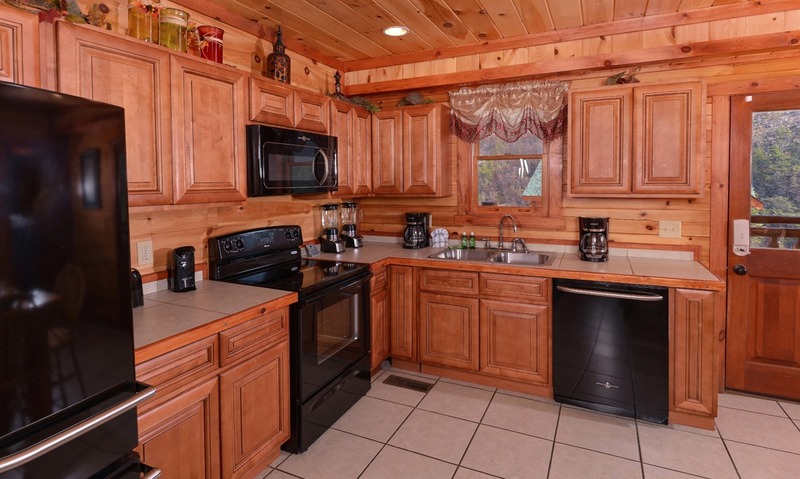 Every large group cabin needs a large-scale kitchen, and Jennie’s Cove does not disappoint! This kitchen provides all your major appliances in black. These include a dishwasher, electric stove and oven, an over-the-range microwave, and 2 full-size refrigerators. With all this equipment—plus a few countertop essentials like coffeemakers and blenders—you can easily plan for family dinners around the table inside Jennie’s Cove. 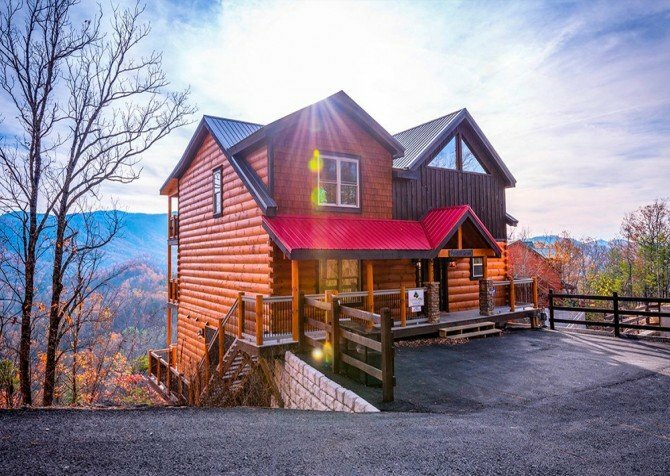 For special occasions and celebratory meals during your stay, we also recommend looking into catering and delivery services offered by several Pigeon Forge restaurants. Conveniently located next to the kitchen is the Jennie’s Cove dining room. 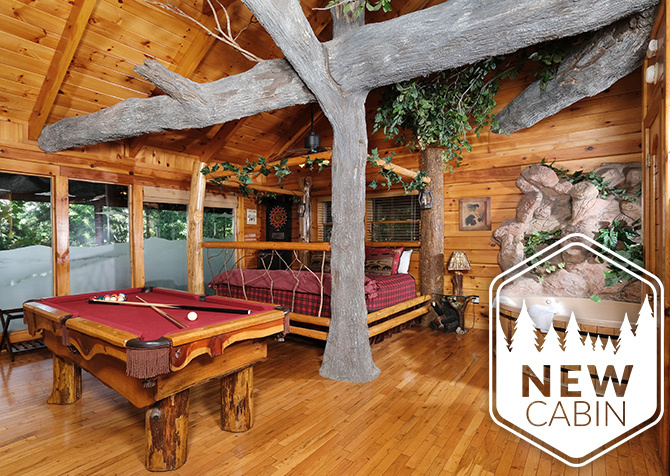 This large wooden dining table has room for 12 guests—nearly your whole group —and the open-concept design of this cabin’s main floor makes it easy for extra guests to find a comfortable seat on the couch without feeling cut off from the conversation. 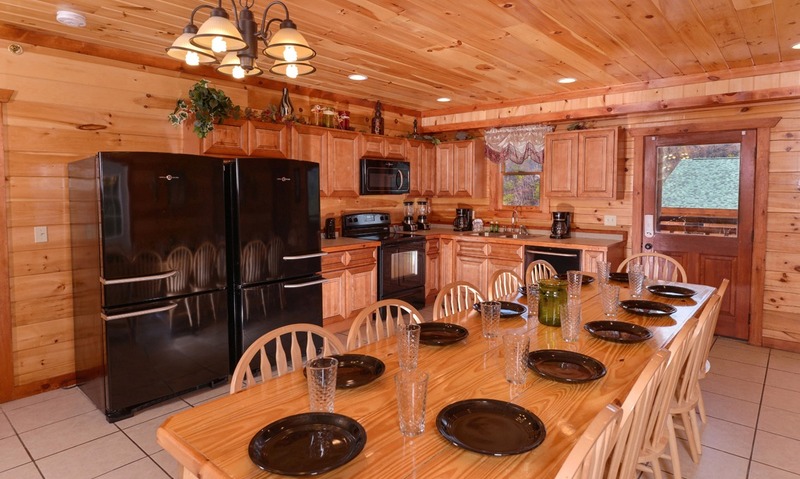 If you’re looking for a place to carve a Thanksgiving turkey or spread out an assortment of snacks for game day, the Jennie’s Cove dining table is exactly what you’ll need. 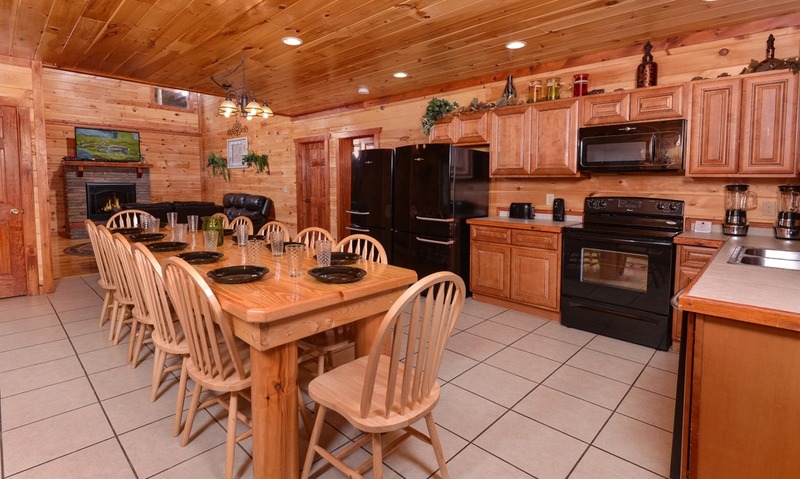 Take advantage of this large group cabin’s 12-person table during you stay! 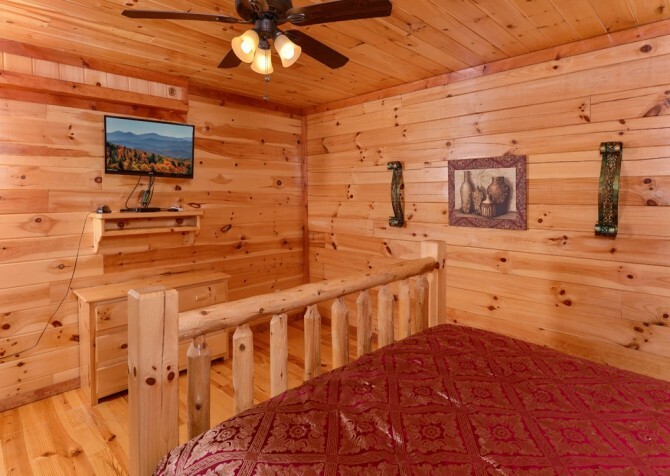 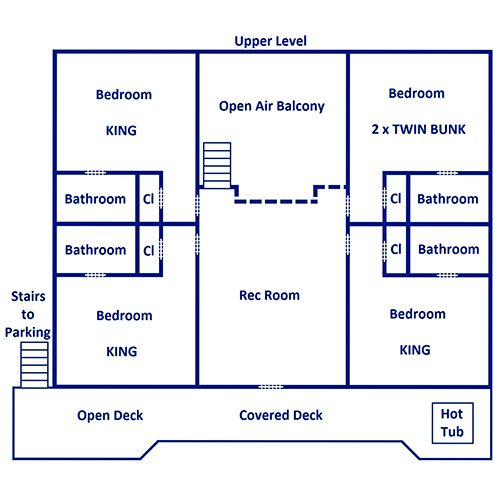 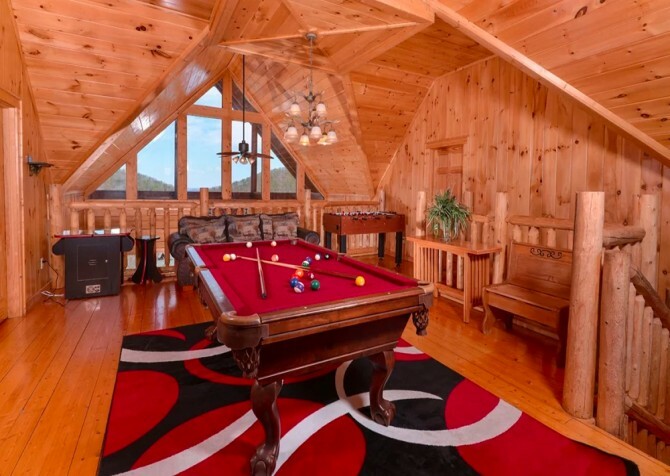 A favorite feature of many of our Smoky Mountain rentals is their game room, and inside Jennie’s Cove, you’ll find a large game room located in the upstairs loft. 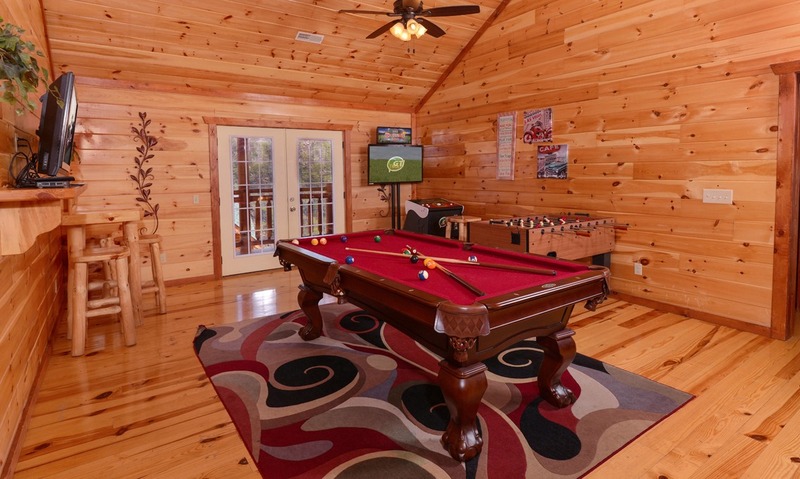 This fully equipped space comes with a pool table, foosball table, and a Golden Tee arcade game connected to a big screen TV. 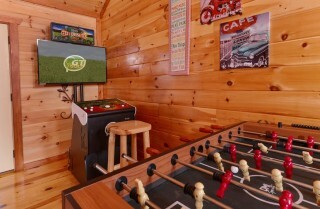 You’ll also find another big screen mounted on a separate wall so you can keep the game going in the background while you play a game of you own with friends and family. 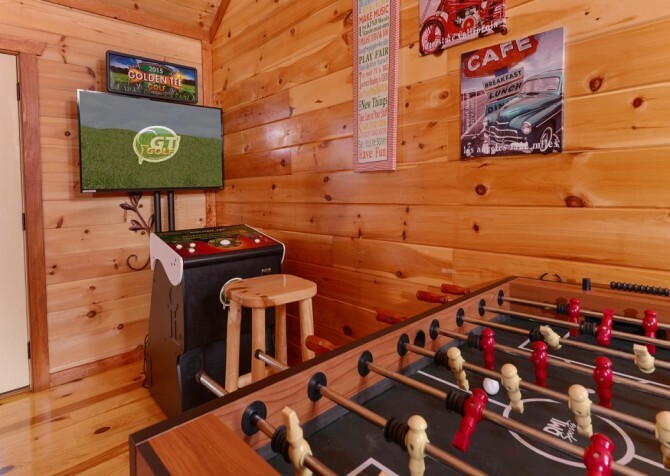 Besides all this, the game room inside Jennie’s Cove provides direct porch access from a set of French doors and a small seating area for cards or a small board game in the corner. 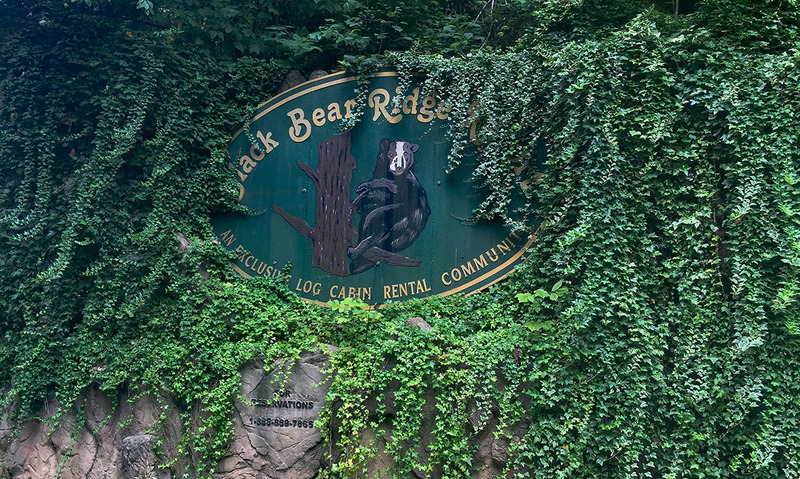 There’s a lot to love about vacationing in the Smokies—the sights, the scenery, the assortment of downtown attractions. But sometimes our favorite memories are the simplest, like watching a favorite DVD with your family inside your rental’s private home theater! With several cushy couches on raised flooring, you’ll be able to fit most if not all of your large group inside the home theater of Jennie’s Cove. 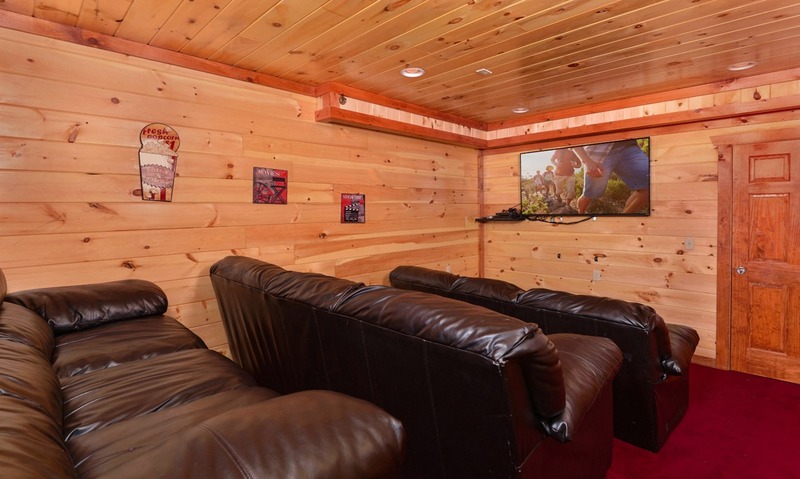 Bring your favorite DVDs or rent a new one at a nearby Redbox for a movie-watching experience that’s as fun as it is cozy! 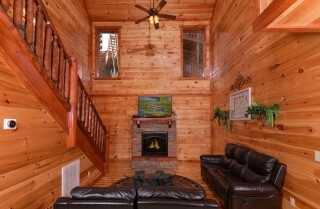 This cabin provides the big screen TV, the Blu-ray and DVD player, the comfy seating, and the theater-like atmosphere. 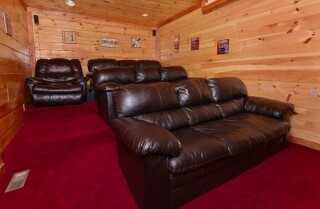 All you need is the movie and the popcorn! 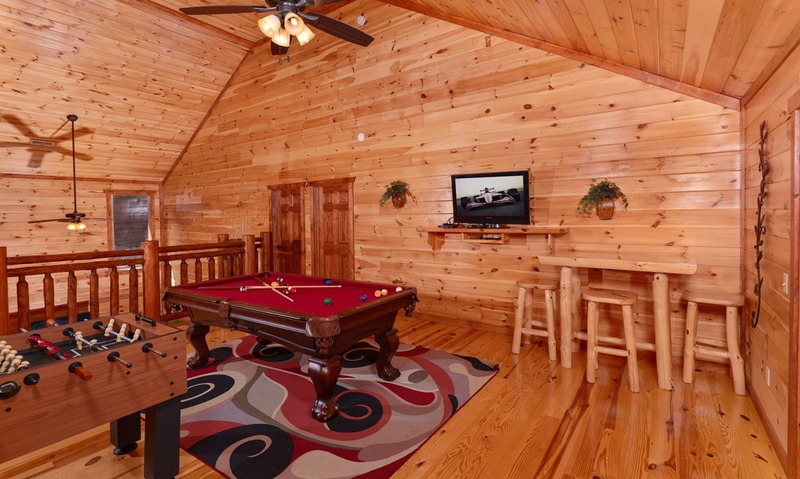 A loaded game room, a private home theater room—these aren’t the only entertaining amenities you’ll find inside Jennie’s Cove. 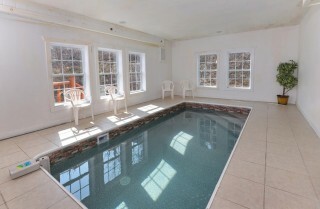 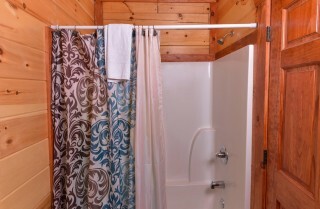 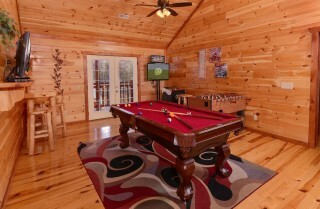 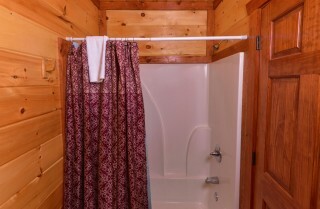 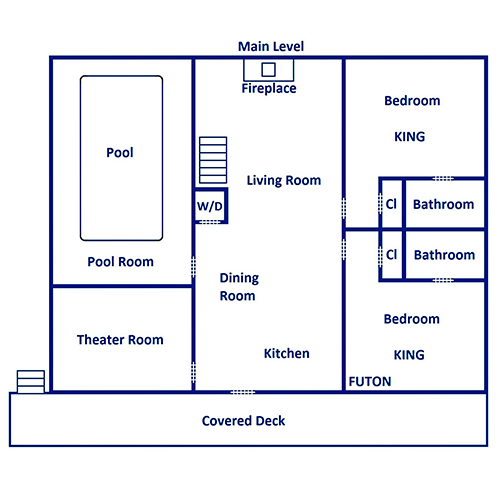 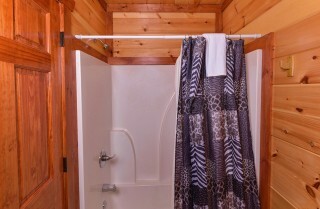 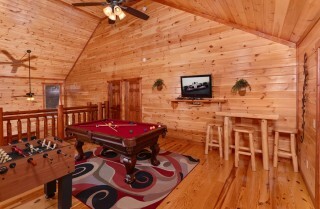 This large group cabin also provides a private indoor pool (85 degrees)! 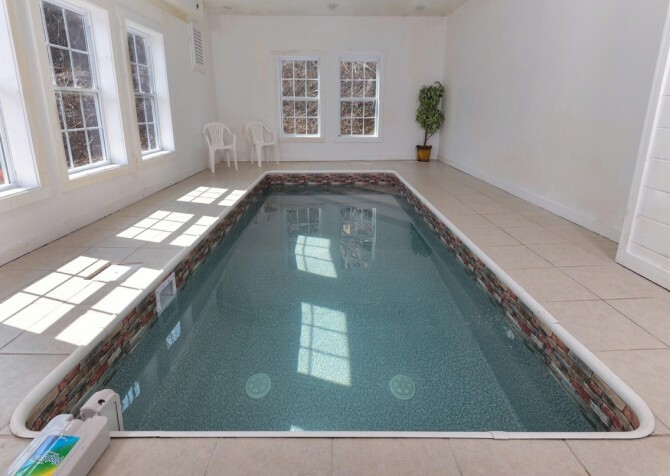 Large enough for several guests at once and surrounded by several windows, this pool room is a great option for indoor fun no matter what time of year you plan your visit. 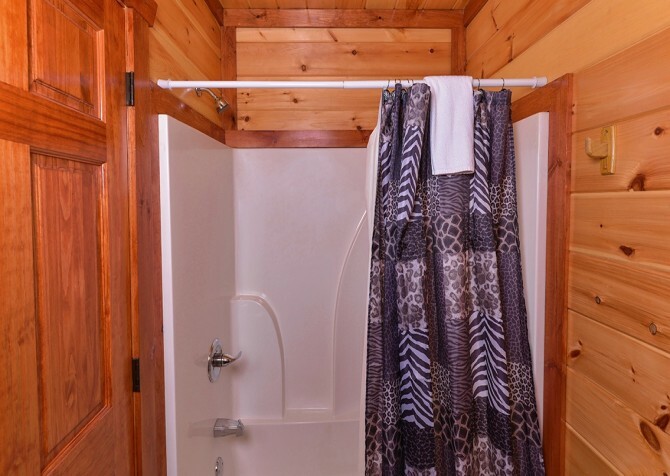 In the fall, enjoy the changing leaves right outside your windows, and in the winter, splashing around at Jennie’s Cove is sure to be your favorite way to beat the wintertime blues. 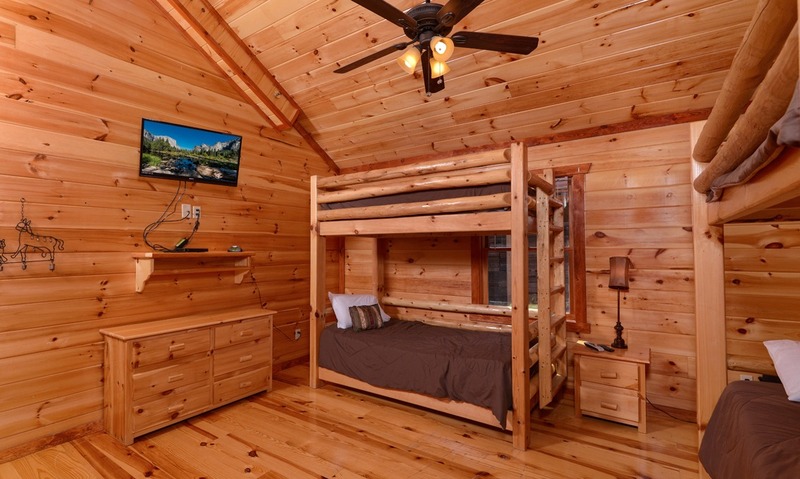 This cabin’s private pool is fun for every age and especially if you’re traveling with little ones and is conveniently located on the main floor of this cabin. 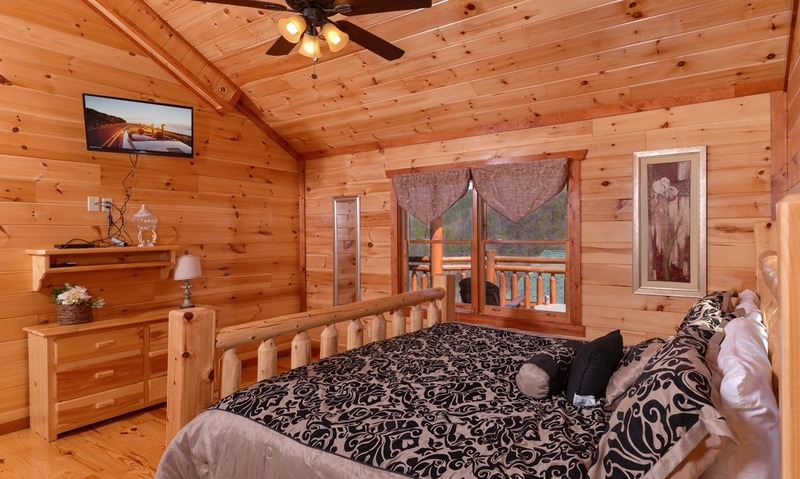 Take advantage of all Jennie’s Cove has to offer during your Pigeon Forge stay! 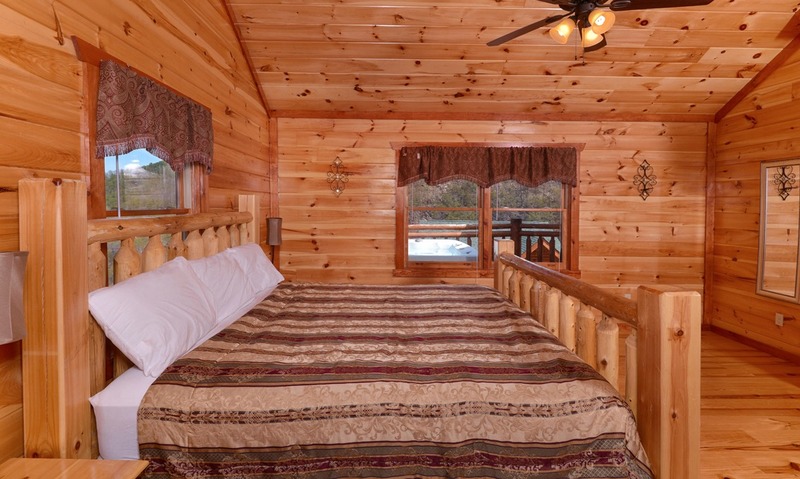 For a group of 18 guests, you’ll want plenty of cozy sleeping spaces. 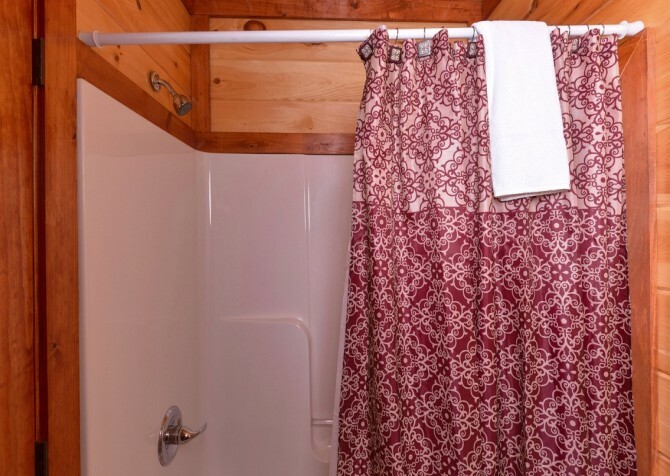 Thankfully, Jennie’s Cove comes with 6 bedrooms and 6 bathrooms, providing privacy for 5 couples and a versatile bedroom for kids or single adults. 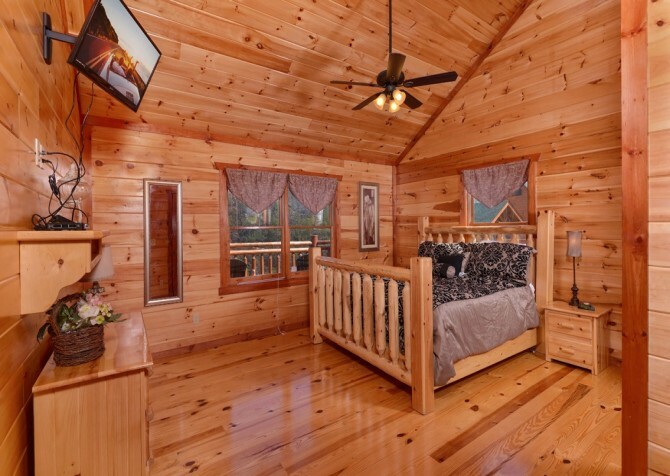 The first 5 bedrooms offer king-size beds, log-style furniture, and homey additions like ceiling fans, nightstands, and reading lamps. 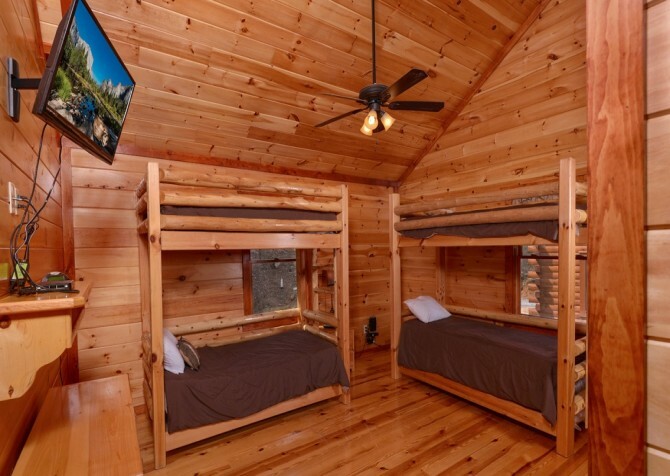 The sixth bedroom offers 2 twin bunks, and all 6 bedrooms provide their own TVs, en suite bathrooms, and windows with Smoky Mountain views. Jennie’s Cove also offers a futon for extra convenience during your stay. 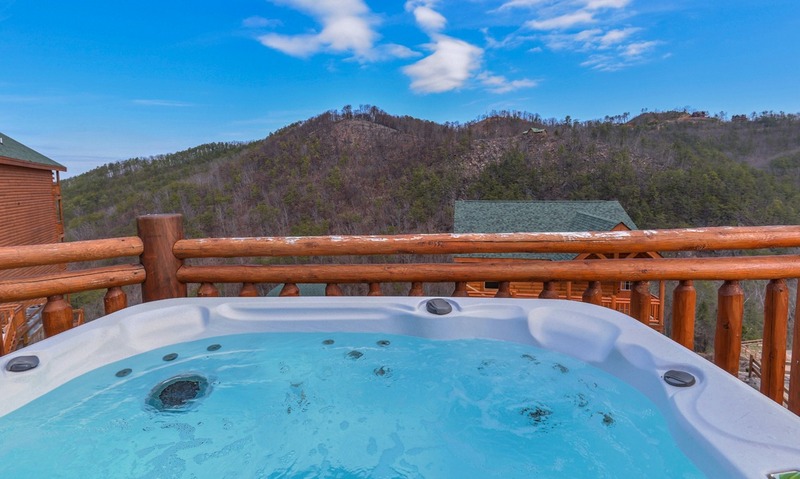 Surrounded by the rolling Smoky Mountain hills, Jennie’s Cove has several options for relaxation and fun in its outdoor spaces. 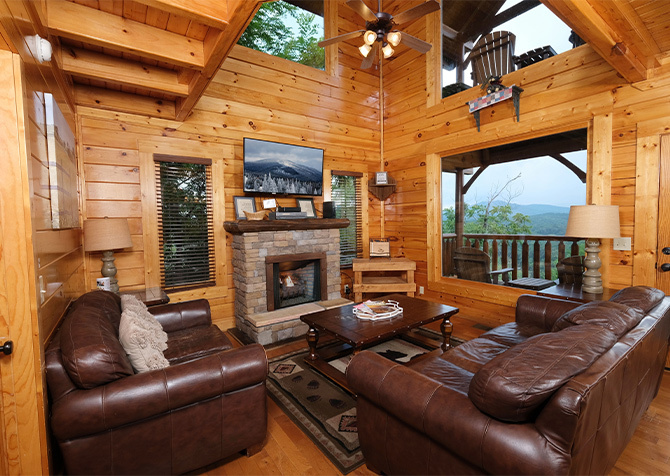 Enjoy views of the beautiful mountains from the rocking chair porch with a glass of locally made wine in your hand. 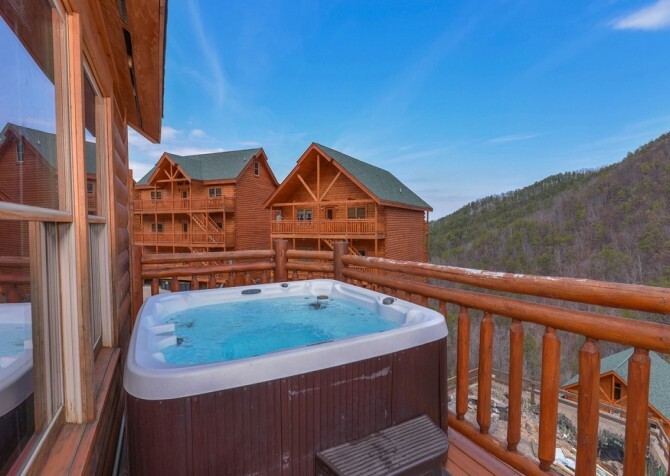 Or go for a relaxing soak in your open-air, outdoor hot tub with family and friends. 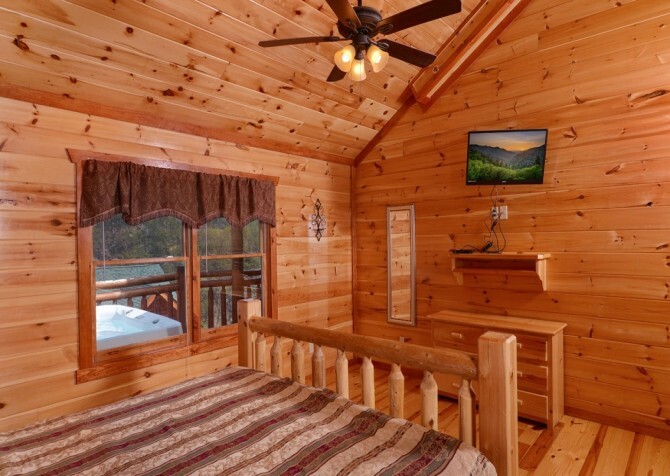 If it’s a sunny afternoon, spend some time with a good book beneath your covered porch, or if it’s a cool Smoky Mountain morning, grab a mug of steaming coffee and enjoy the sounds of birds and the colors of the trees. Jennie’s Cove also provides a charcoal (picnic area–style) grill, making Fourth of July barbecues and weekend cookouts easy to plan for your Pigeon Forge getaway. 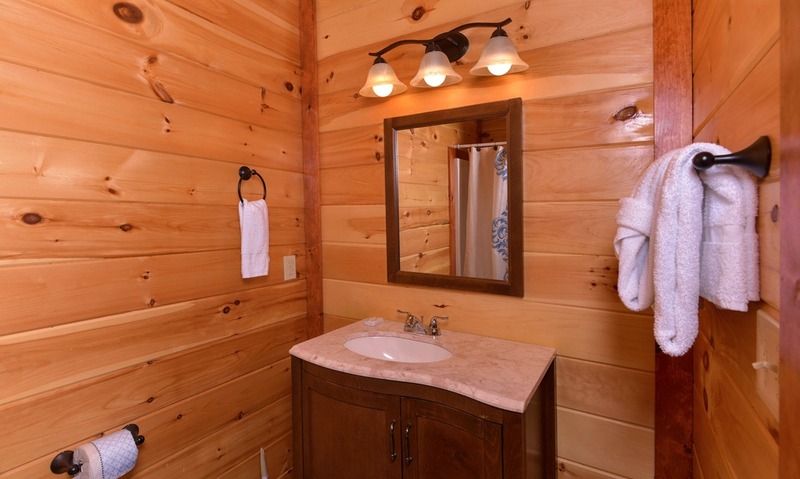 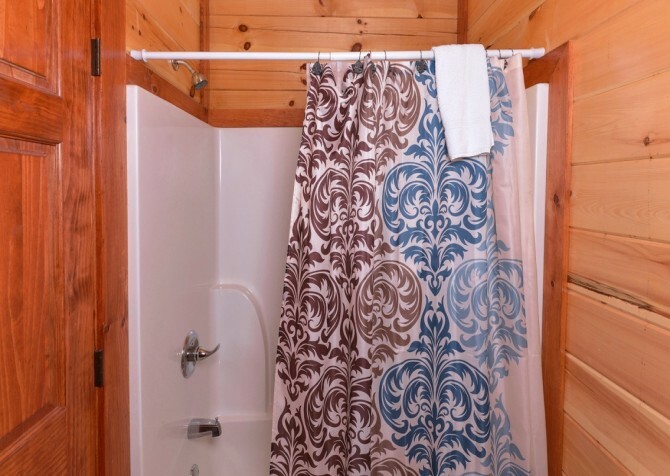 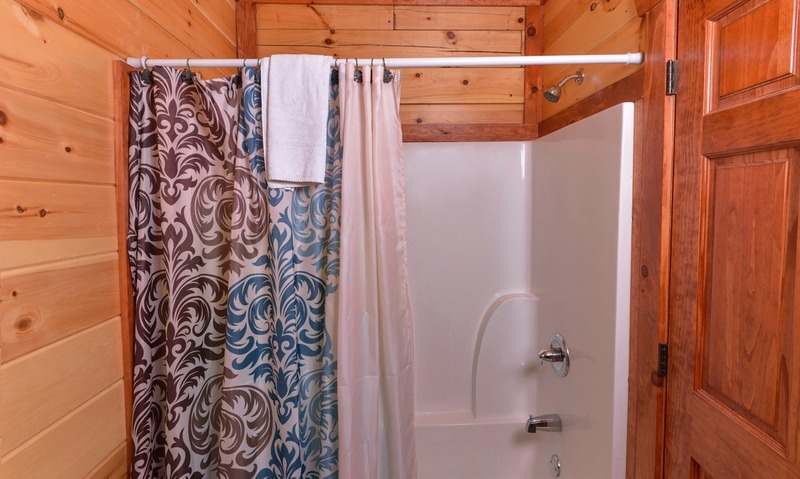 Along with entertaining amenities galore, Jennie’s Cove provides its guests with some convenient additions like a washer and dryer, which is sure to come in handy after hiking in the national park or swimming in your private indoor pool. 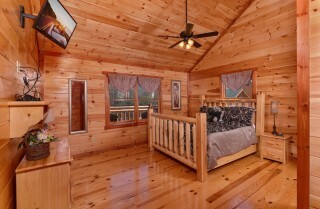 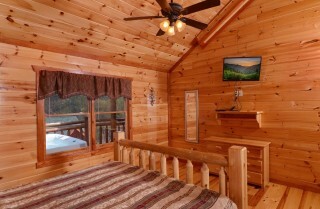 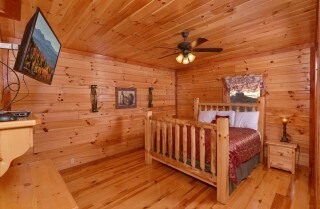 This cabin also comes with wireless internet, which you can use to stay in-the-know with our Cabins for YOU blog. Finally, Jennie’s Cove provides its guests with a flat, paved driveway with room to park a trailer. 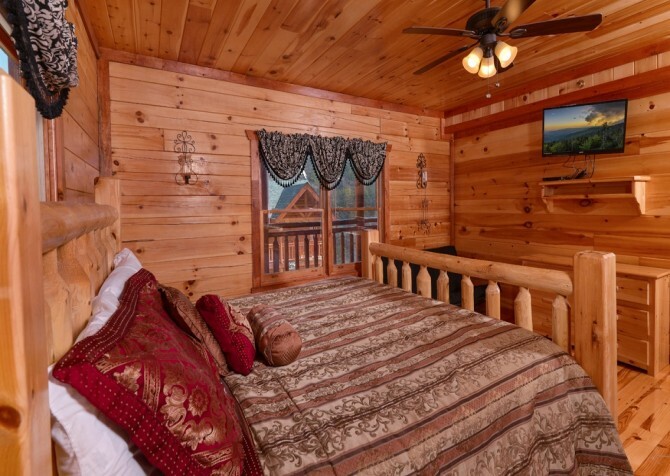 With live shows, world-class roller coasters, Southern-style restaurants, and more, Dollywood is a crowd-pleaser for sure! 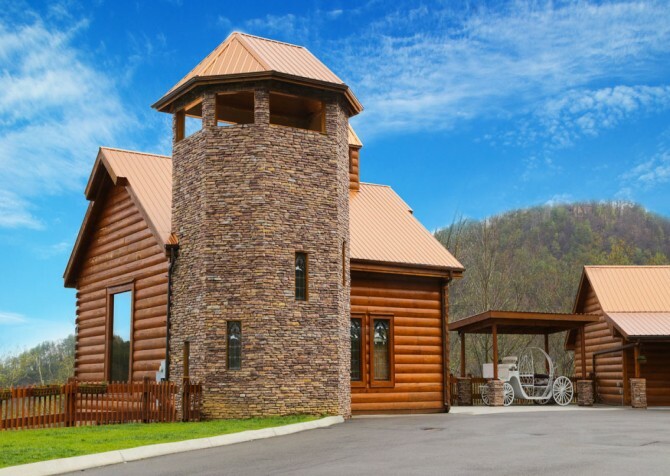 Get your picture with your favorite Hollywood stars at this Pigeon Forge museum—your group will be showing off their selfies for days! If you’re looking for something where your guests can work together and make memories they’ll never forget, try the Escape Game at The Island in Pigeon Forge. "My family and I had the best time in our cabin in Pigeon Forge; we said that we have to come back again really soon!"